I am not at the place where I originally wanted to be in my life. At the age of 29, I am working in an entry-level retail job (that I really enjoy, don’t get me wrong) that has absolutely nothing to do with the bachelor’s degree that I worked so hard to earn over 7 years ago. I am currently putting myself through school, still going through menial prerequisites in order to get accepted into nursing school in the very near future. I am, and have always been, a straight-A student, but my work ethic tends to just make me feel angry lately. I force myself to work hard and do well on tests regarding subjects that I really don’t care about, and watch other students (of whom most are 10 years or more younger than me) skate by and seem to have lovely, exciting lives and either the same or better jobs than me. I’ve had higher-paying jobs with more responsibility. And this fact occasionally makes me look at my current life with more than a little tinge of depression. I know that I’m working towards a larger goal. I know that lots of people change careers and their lives at mid-stream and end up being very successful. I know that the hard work that I put in now will result in multiple rewards later down the line. However, it’s hard to remember this when you’re standing at a cash register, ringing up someone who used to be a close friend from high school, realizing how much you’re stuck in this weird life you didn’t think you’d be leading. 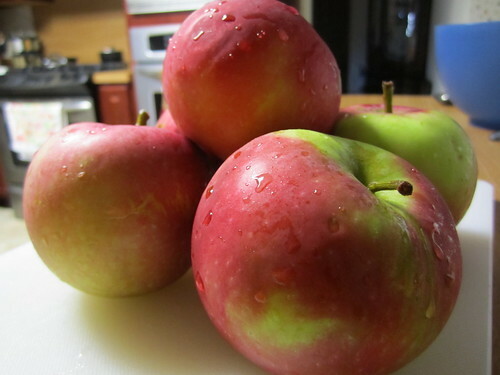 Then today, I realized we had lots of apples in the fridge and the temperature was starting to drop. I realized that I now had the opportunities to have evenings free to spend with Dan and time to enjoy something while I worked on homework. 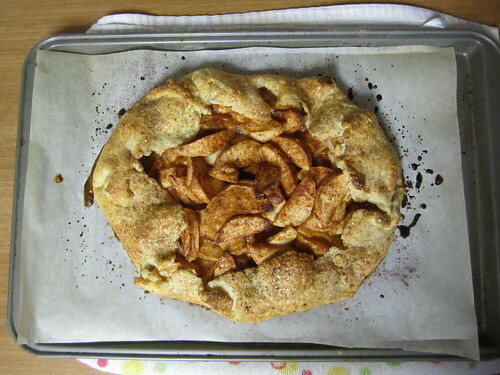 I decided to make a galette. 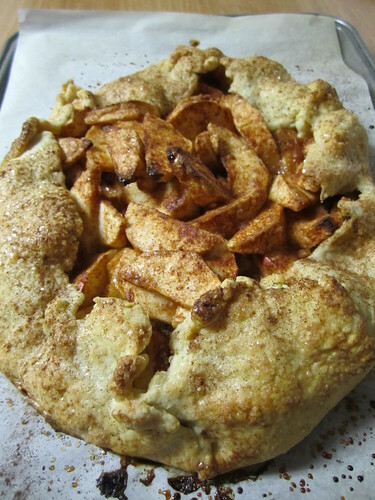 A galette is a rustic tart/pie that’s not too picky about whether or not your crust technique is perfect or if you have enough or too much apples or whatever extra tasty bits you might want to throw in there. It tastes awesome all the same. 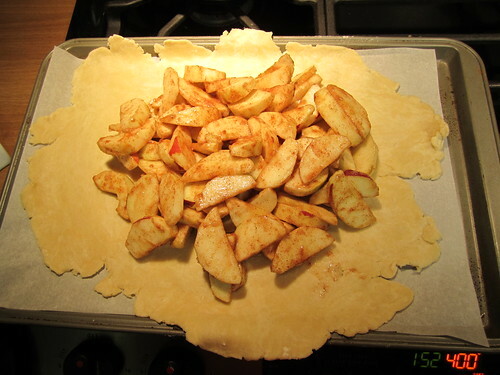 I always use Pinch My Salt‘s Apple Galette recipe. 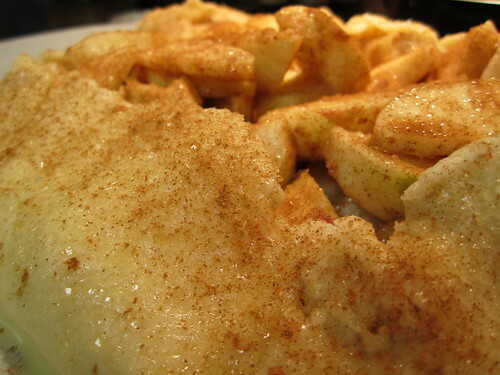 It’s served us well so many times in the past and is easily adaptable to whatever fruit you may have in mind. 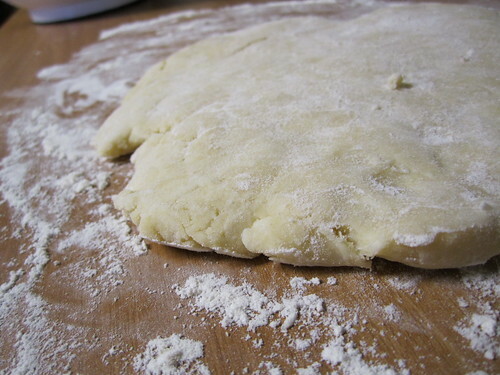 One thing that I always do to make my pie/tart-making easier is a trick I learned from Joy the Baker and her Easy No-Roll Pie Crust Method. 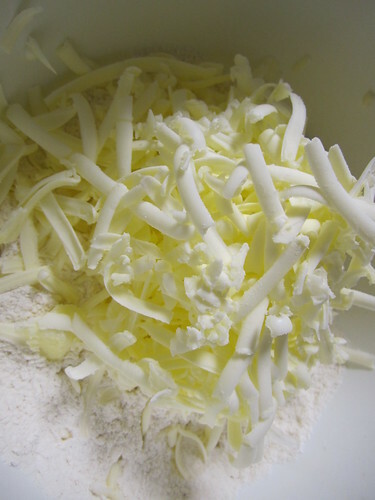 When making crusty-type things, I always throw my butter in the freezer for a few seconds, and then grate it with a cheese grater into the bowl before blending it in. It makes incorporating those ingredients so much easier. It makes life better. Trust me. 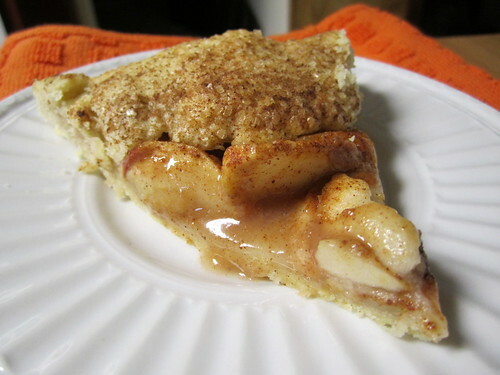 All those sugared and spiced apples (I always add plenty of cinnamon and nutmeg in there) get poured into that lovely buttery, flaky crust. 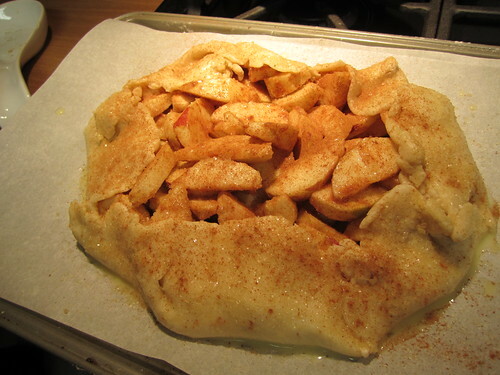 Then you just fold up the sides as prettily or as lackadaisically as you want, egg wash the sides, and sprinkle with some raw sugar and cinnamon. Yeah, I might have a slight cinnamon obsession, especially in the fall. Like I’ve heard Giada de Laurentiis say before, cinnamon feels like a warm hug. A hug I feel like we all need right about now. 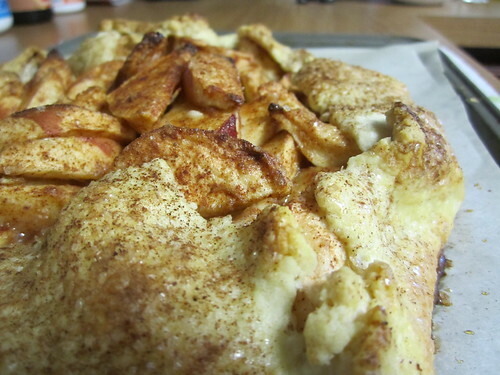 Pull that bad boy out of the oven and marvel at its delightful rustic-ness. Let’s get a closer look. Better. Crusty, flaky, warm, spicy, tart, and delicious. I had to cut a piece to get a good picture of the sweet, gooey insides, but I had to leave it to the side and not eat any until Dan gets home. It was a struggle. I mean, look at that. Good grief. I know that making pies is not the answer to all of my life’s problems, but it certainly helps. 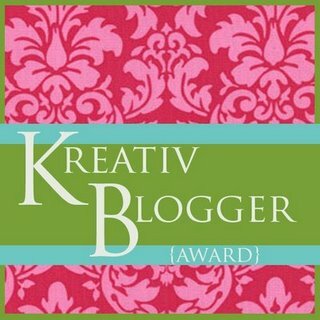 It helps to know that I can make something like this come out right, even when other things aren’t perfect. It helps that even if the pie’s not perfect, it’s still going to taste amazing and will make someone I love really happy. It helps that it smells like fall and lets me know that time is still passing and that my goals are getting closer. Sometimes you just need to make something over and over. You need those recipes that are always in your back pocket, waiting to brighten your day. Those recipes that you know you’ll always have the ingredients for, that bring style and class to what can seem like an exceedingly boring pantry. These are my newest modification of everybody likes sandwiches‘s Moosewood Fudge Brownies, which I have probably made eleventy-billion times. 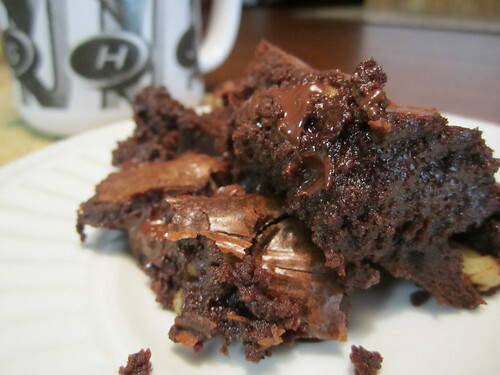 They are probably Dan’s favorite thing that I make, and it’s all because of their delicious fudgy texture. They are always rich and sinful, and can be doctored up a number of different ways, depending on what you have in your kitchen. I love the ritual of baking something that you’ve made several times before. You collect your supplies around you. You go through the steps and do them the same way every time. You enjoy the familiarity and know that you’ll be pleased with the result. My strong attachment to this kind of feeling probably explains why I’ve watched the tea ceremony scene from Karate Kid, part II on repeat so many times. I’ve made them so many times that I don’t really think about it anymore. 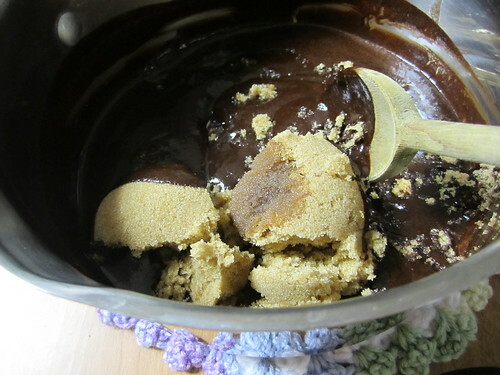 The recipe does start the best way that a recipe can start, though, with melting together chocolate and butter. There we go. 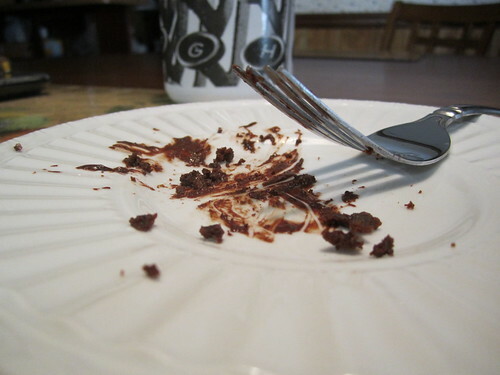 This is the point where I have to remind myself that licking the spoon is not yet an option because unsweetened baking chocolate + unsalted butter = taste you can’t get out of your mouth for far too long. 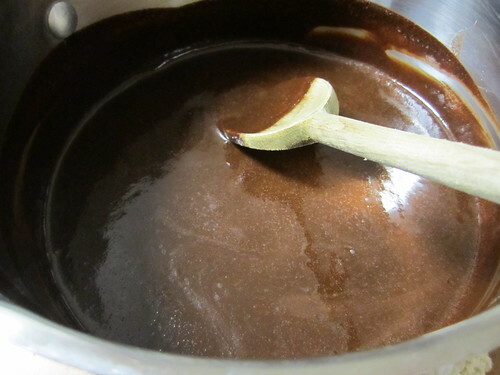 Everything just gets mixed into the same pot you melted the chocolate in. 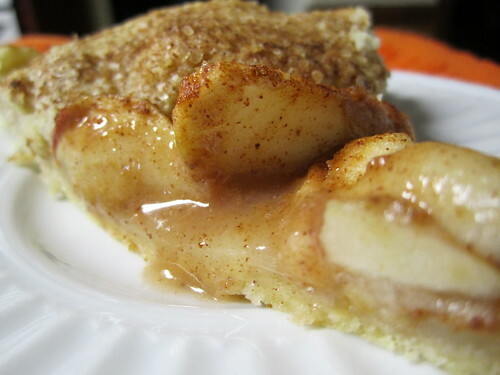 Only brown sugar in this recipe, for that richness and depth. Eggs. I have nothing poetic to say. Flour. Again, nothing fancy, just necessary. Let’s pretend I took a picture of the chocolate chips that I added before mixing it up. And the walnuts, too. The batter is still a little warm when you start mixing in all this goodness, so my chocolate chips are already starting to melt a little. A happy mistake. 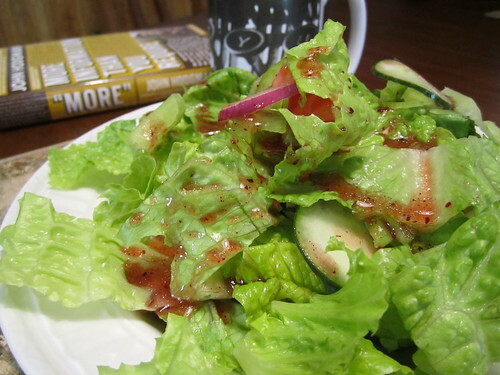 As I’ve said before, eating a salad while you’ve got delicious baked goods in the oven is a guilt-eraser. Also, how did I live a proper life before I got a salad spinner? It makes me happy. Now, after dutifully eating our salad, we’re allowed to dig in on this gooey, melty, not-properly-left-to-cool-after-coming-out-of-the-oven treat. 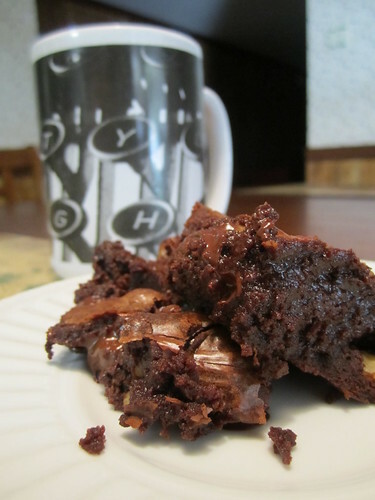 This is my favorite thing about these brownies. They never quite get fully set, especially when you start throwing extra things in there, but that just turns it into a big, rich, ridiculous mess. 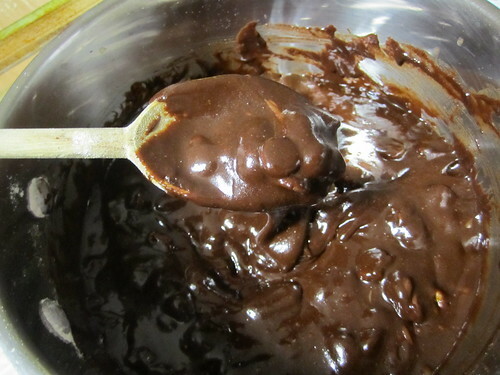 Go and get some baking chocolate and do this for yourself. Only, you should learn from my mistake and buy some vanilla ice cream to get in on that action. Preheat the oven to 350. 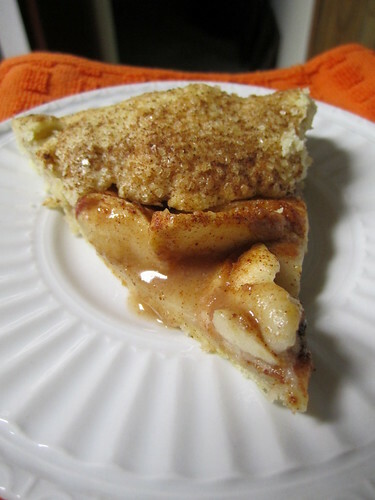 Lightly coat an 8- or 9-inch square baking pan with cooking spray. 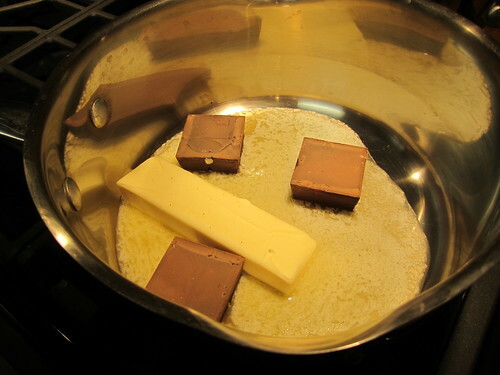 In a pot large enough to hold all of the batter, melt the butter and chocolate together on low heat, stirring occasionally. Remove from the heat. 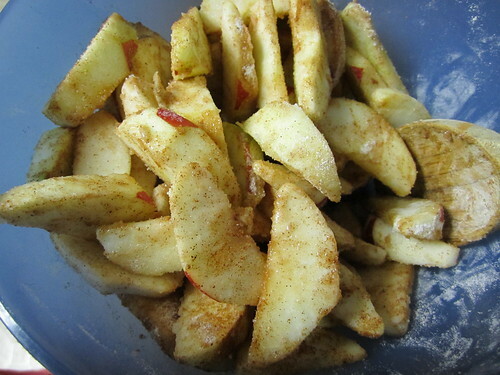 Add the brown sugar and vanilla and beat by hand or with an electric mixer. Add the eggs and beat well. 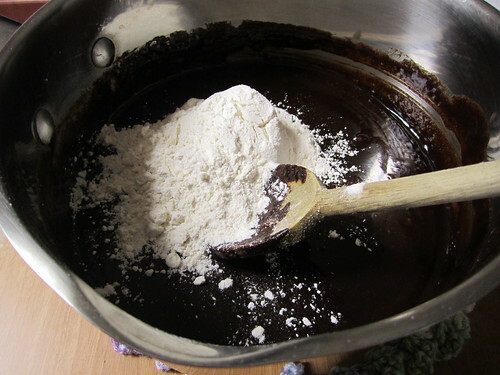 Stir in the flour and mix until the batter is thoroughly blended and smooth. 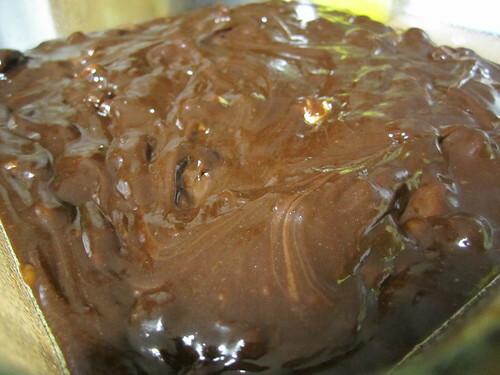 Gently fold in chocolate chips and walnuts. 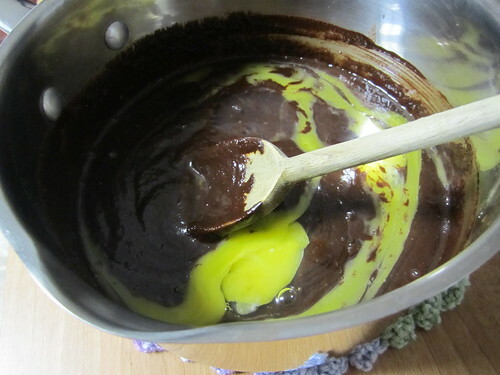 Pour the batter into the prepared pan and bake for about 20 minutes, until the brownies are just beginning to pull away from the sides of the pan and are still fudgy in the center. 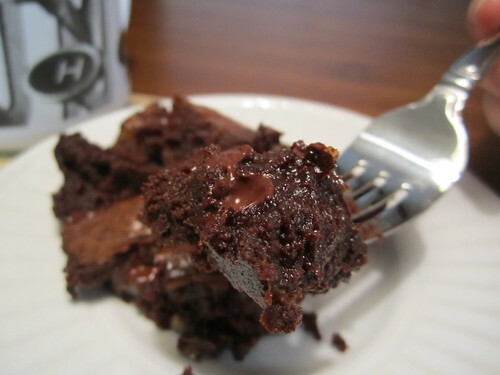 If you prefer more cake-like brownies, bake an additional 5 minutes.